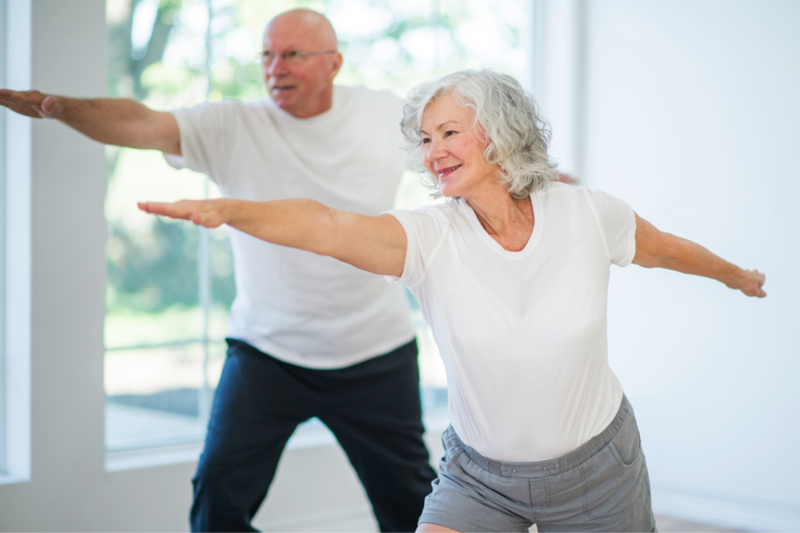 These exercises can help reduce the risk of senior falls. Fall prevention: it’s one of the leading concerns of healthy aging, considering the fact that falls are one of the top causes for severe injuries and even loss of life in older adults. At Compassionate Nursing Services, providers of the highest quality home health care St. Louis families trust, we strive to make sure the home environment is safe from fall risks and that modifications are made to help the older individuals in our care remain protected against senior falls. Chair Lift: In a seated position in a stable chair with arms, hold onto the arms and lift the body up, utilizing the lower body muscles as little as possible and using upper arm strength. Maintain the position, and then gently lower back to a sitting position. Repeat ten times. Forward Lunge: Stand up straight with feet directly below hips. Grip onto a secure chair situated to one side of the body, and then step forward with one foot, trying to keep the rest of the body straight and tall. Bend the leg in front until the knee in the back is as close to the ground as possible. Then use the front leg to push the body back up to a standing position. Repeat ten times with each leg. Leg Raise: While seated, extend one leg straight out in front of you, and then bend the knee and bring it to your chest, without shifting the upper body. Stretch the leg back out straight once again, and then bring the foot back to the ground. Repeat 10 times with each leg, and if at all possible, try with both legs at the same time. Weight Lift and Bend: With a chair next to you for balance, and a 2-pound weight in the other hand, bend forward at the waistline, bend the arm holding the weight up to your chest (with the elbow kept at waist level) and then extend the arm behind you before bringing the weight back to your waist. Repeat ten times with alternate arms, increasing weight if desired. Toe Touch: Standing up with feet together, slowly and gently roll your upper body towards your toes, reaching down with the fingers, as far as possible comfortably. Keep legs straight for the duration of the bend. Then slowly and carefully roll the upper body back up to a standing position, and repeat ten times. For more fall prevention tips and exercises, or to set up an in-home evaluation of your senior loved one’s home to reduce the risk of senior falls, contact Compassionate Nursing Services, the leaders in the home health care St. Louis seniors need, by calling us any time at 314-432-4312.